Please phone us on 01285 653489 to make a booking, or you can email your booking enquiry to info@apsleyvilla.co.uk and we will get back to you within 24 hours. We accept cash, cheque and all major credit and debit cards. Check in time: From 12 noon until 9pm. If an earlier or later booking in time is required please mention when placing your booking. We request a non refundable deposit (equivalent to your first night stay) to confirm a booking and 48 hours notice of cancellation to avoid payment of the balance. Access to the railway system is at Kemble railway station on the main line to London Paddington station, about 4 miles from the town. Access to our guest house from the front of the building is via four steps, the first one being four inches, the second is seven inches, the third is nine inches and the fourth step is seven inches. Once inside the floor is level and carpeted. 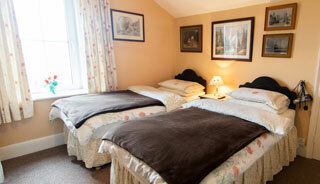 We have direct access from the hallway to a ground floor room. 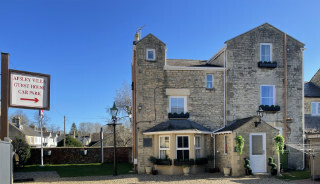 Apsley Villa provides affordable guest house accommodation near the centre of Cirencester, "the Capital of the Cotswolds".